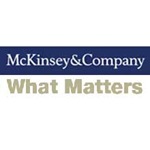 What Matters represents a new direction for McKinsey Publishing. To our long tradition of client-driven research we’ve added a new tradition: knowledge derived from convening some of the best thinkers from around the world. We began last summer by asking researchers, academics, journalists, policy makers and executives to address ten big questions, whose answers will shape our collective future. In each case, we asked our essayists to take a long view and tackle tomorrow’s trends rather than today’s headlines. McKinsey has set up the following categories: Biotechnology, Climate Change, Credit Crisis, Energy, Geopolitics, Globalization, Health care, Innovation, Internet and Organization. Each category has a Featured Topic, such as “How will business organizations change in the 21st century?” in Organizations. Students of leadership will find something of interest in every category and one of the great things is that the social media format give readers an opportunity to enter into a dialogue with the very extensive and impressive list of contributors. What Matters also has a section called The Debate Zone where experts face off on pressing topics. Currently, the Debate is centered on Carbon Tax V. Cap and Trade and as of this posting there are 99 reader comments to the post. There’s a lot of good going on in McKinsey’s What Matters and it should be interesting to see how it develops in the future. Tagged with McKinsey & Company.